Who's interested in winning two free tickets to the 7th Annual Discover Virginia Food & Wine Festival, held April 21-22 in Ruckersville, Virginia? To enter, just Like the Virginia Wine TV Facebook page by April 15th. On the 16th we will select a name at random that will receive the two free wine tasting tickets. According to the sponsors, the annual festival will offer its unique atmosphere of family friendly festival entertainment, food vendors and wine tastings. The festival will spotlight Virginia Wineries as well as many local restaurants and artisans including Burnley Vineyards, Ducard Vineyards, Mountain Cove Vineyards, and Saude Creek Vineyard. Ticket prices are reasonable with an advanced ticket priced at $14.00 and $20.00 the day of. But why not try for the two free tickets. Last week we attended the 13th annual Washington DC International Wine & Food Festival primarily because friends from the Finger Lakes Wine Country were pouring. In addition, this is always an opportunity to find interesting and unique wines and spirits from regions throughout the globe. Quebranta is a non-aromatic varietal that evolved on the Peruvian coast. It is the most popular pisco grape in Peru and gives body and fullness of flavor to Pisco Portón. Albilla is a fragrant green grape with a soft and fruity taste structure. It is prized for its smooth finish in pisco. Torontel grapes have a strong citrus and peach aroma that lingers on the hands and clothing of workers who handle them. Its expression in the glass is alive with heady aromatic complexity. There were several other spirits we enjoyed tasting. Philadelphia Distilling was pouring a new 100% corn whiskey - straight spirit - no oak aging. The sweetness from the corn was prevalent with no noticeable burn. Blue Star Beverages Czarskaya (czars gold) Vodka and completely smooth wheat based vodka distilled 15 times - yes fifteen - and filtered 20 times through a 22 carat gold mesh. Not sure what that process beings to the table - but the end result is a nice vodka. And then there was the iichiko Shochu - a spirit I had never heard of before. iichiko was pouring several styles - all made from Australian grown barley. The barley is polished and then made into a mash which is then distilled into a relatively low alcoholic spirit - starting at just 30%. Each was also extremely smooth. Interesting - but not sure I'm willing to commit to a long term relationship. Need to explore a little more. As for the other wines, there were many, many interesting wines. Strong reds from Wild Horse Winery, Charles Krug Winery, and Franciscan Oakville Estate; Pinotage from many South African Wineries; Rhone wines; and plenty of Spanish Tempranillo and Albarino. Explore these wineries and regions. There's plenty for all of us to learn. Cheers. This weekend, the Crystal Gateway Marriott in Arlington Virginia is hosting the 7th Annual Virginia Wine Showcase, two days to explore Virginia Wine Country. There will be 200 wines poured by about 20 Virginia wineries. There are also several interesting seminars such as Wine 101, Cigar Pairing, VA vs the World, and Vino 50. I will be volunteering on Sunday for Annefield Vineyards, a winery from southwest Virginia producing classic wines such as Chardonnay, Cabernet Franc, Cabernet Sauvignon, and of course, Viognier. Stop by and say hello. This month we finally got around to opening a bottle of sparkling wine that we had received late last year - just in time for Wine Blogging Wednesday 74 which is focusing on Value Sparkling Wine. This was the Yellow Tail Bubbles Sparkling White Wine, a very affordable sparkling wine ($10) accompanied by an interesting closure device. This is the Zork, a bottle topper that pops like a cork but can also be used to reseal the bottle, and only available on Yellow Tail sparkling wines. If you don't finish the bottle the first evening, then seal the bottle and in theory, the Zork will maintain the gas pressure. And in fact, it does work. One week ofter opening, we opened the wine - and yes, we wouldn't recommend this length of time, but the wine was still carbonated. Since this wine isn't carbonated using méthode champenoise, I suspect Yellow Tail injects a little extra carbonation to help maintain gas levels over an extended time. Now to the wine and, really, for a $10 wine - this is a good deal. Its not completely dry, but with decent fruit, low alcohol (11.5%), and a creamy finish complements to a secondary malo-latic fermentation. Don't get too many inexpensive sparklers going through a secondary fermentation - maybe the grapes were picked a little early - holding more acidity. If you are looking for an inexpensive sparkling wine, this one's for you. What's in the Barrel at Paradise Springs Winery? 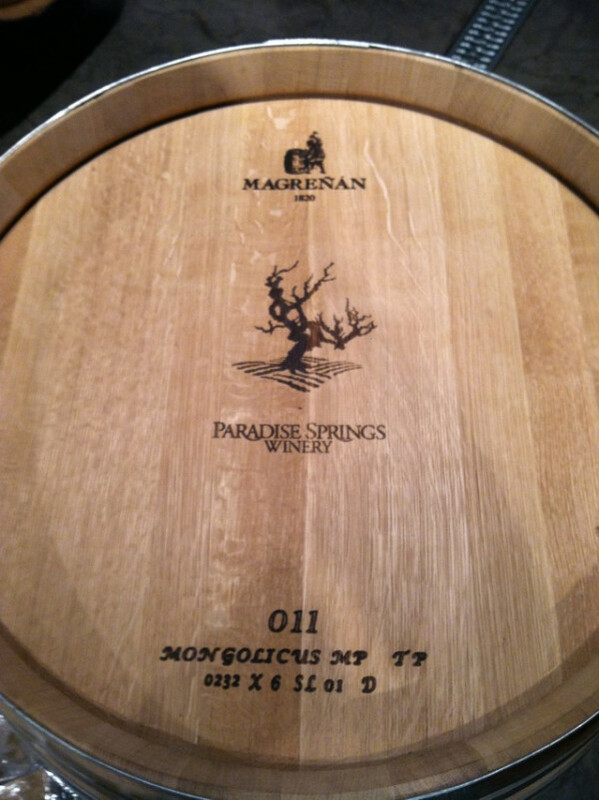 During our Wednesday night #winechat featuring Viognier, we tasted and tweeted at Paradise Springs Winery. After the discussion, Kirk Wiles invited us to sample their 2011 vintage aging in barrel. Now, 2011 will be a challenging year - across the United States - even Mediterranean Napa Valley was affected by late season rain. In Virginia, the summer started off hot - with many grapes beginning to ripen on schedule. Then, in September, the weather cooled and the late season rains arrived. The grapes stopped maturing. Even worse, the grapes for one of the wines we tasted during #winechat, the 2011 Keswick Vineyards Les Vents d'Anges, were harvested the day after a hail storm. Can you image the condition of that fruit? Stephen Barnard performed admirably with that wine, and other winemakers will have work just as hard for their 2011 vintage. At Paradise Springs, winemaker Rob Cox and assistant winemaker Michael Chang, are paying close attention to the wines in the tank and in the barrel. This evening we tasted Chard onnay, Cabernet Franc, Cabernet Sauvignon, Malbec, Tannat, and Norton - all aging in different cooperages. For instance, they are aging Chardonnay in neutral and medium oak and will blend the components together before bottling. Most of the red wines are being aging in a reductive manner - where the wine may not be racked until bottling. The Cabernet Franc displayed this reductive character immediately, but once past the nose, the cherry fruit presents itself nicely. And the reduction will dissipate when racking at bottling. 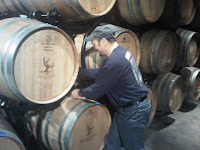 We also saw how the winery is the only Virginia winery to utilize a Chinese barrel. Yes, Chinese, from the Mongolicus forest. I believe it was the Malbec - and so far - so good. Yet, the biggest surprise was their Norton. Sourced from Chrysalis Vineyards, these grapes shrugged off the volatile weather as if laughing at the viniferia outsiders. Heat, humidity, cold, rain - so what. In barrel less than a couple months, the wine is already deep garnet in color with bright fruit flavors with none of the astringent acidity associated with new or poorly made Norton. This wine could be bottled today - it is that good now. And this wine, and how the grape responded to the 2011 season, justifies Jennifer McCloud's passion for Norton. Several Virginia bloggers have challenged our community to post photos of each of our personal wine storage techniques. Like the folks at Virginia Wine Time, I use two distinct areas for storing wine. The first is a Tex-Mex wine bar that's basic ally stores items ready to drink now: whether wine, spirits, or growlers ready for beer. There is no organization to the set; just find an open spot. Matters take a turn for the worse, when storing for the long term. Shielded by the abundance of toys in the basement, this secret collection is hidden from the usual suspects wanting to open bottles of Viognier, Norton, and other local wines collected on our journeys. There's wine from North Carolina and Maryland lost in those boxes; several from Kansas and Missouri; a few from California; and even s ome specialty win es from Florida. Key Lime Wine anyone? Schnebly Redland's Winery has it all. Now you know the secret to wine storage. Viognier - the grape of Condrieu. Or perhaps Languedoc. Definitely Virginia. Arguably Texas. Maybe California & Washington. Then there's Australia. Yes, this sensitive grape has found a home in many places, from its ascendency in Northern Rhone to its expansion into the New World. Despite this expansion, the grape variety is still relatively unknown to the general public? It was for me, until a few years ago. If you need some insight into Viognier, then check out these articles by MyVineSpot, Debra Meiburg MW & Jancis Robinson. But don't delay, because on Wednesday February 8th, we will be discussing Viognier when we host #winechat, the weekly Twitter conversation originated by Marie Payton (@mariepayton) at Life of Vines. And we would like you to participate. All it takes is popping a bottle of Viognier and sharing your comments on Twitter using the #winechat hash tag. Simple enough. Dezel Quillen (@myvinespot) and I (@winecompass) will be joining several Virginia winemakers as we sample and discuss Viognier wines from several regions; but focusing specifically on the Commonwealth. Particularly since the Virginia Wine Board has designated Viognier as that state's Signature Grape. And one of these wines, The Breaux Vineyards Viognier was just selected by Oz Clarke as one of only three U.S. wines to be included in his 250 Best Wines 2012. Over in Texas Wine Country, Russ Kane (@VintageTexas) and Denise Fraser (@DeniseFraser) will be hosting a similar tasting of Texas Viognier. He has posted a briefing for Texas wine bloggers and they will be sharing several wines, including the Lone Oak Winery 2010 Viognier. This wine just received a Double Gold in the SFO Chronicle wine competition. For more information on the event check out the Facebook Event page. If you plan on planning a similar locality tasting - say another #vawine tasting or for North Carolina Viognier or even Central Coast Viognier - let us know so that we can update the event. And be sure to use the #winechat Twitter hash tag as well as the #vawine and #txwine tags when commenting on those wines. Updated: Added video and updated wine list. We always look forward to the Washington DC International Wine & Food Festival and its just around the corner. The Grand Tasting is held at the Ronald Reagan Building and International Trade Center (1300 Pennsylvania Avenue) on February 11th and 12th 2012 from 2-6PM. There will be over 500 wines from all over the globe to sample including those from the Finger Lakes Wine Country, Spain, South Africa, Rhône Valley, and New Zealand. Tickets for the the Grand Tasting are $80-85 a person. See you there. DENVER (February 1, 2012) - Wine enthusiasts who want to explore Colorado terroir and learn more about the state's signature grape varieties are invited to attend the fourth annual DrinkLocalWine Conference on April 28 at the Metropolitan State College of Denver. Open to the public, the conference attracts top national and regional wine writers who regularly cover local wines and “locapour” trends. Colorado’s approximately 100 wineries that grow European-style, cool-climate varieties, such as Riesling, Gewürztraminer and Cabernet Franc, will be center stage showcasing their wines during the all-day conference, which includes sessions, tastings and competitions. The Colorado Wine Industry Development Board is the conference’s primary sponsor; the conference kicks off at 9 a.m. with three seminars: Colorado’s Terroir and the Challenges of High Altitude; Local Food, Local Wine and Why They Don’t Like Each Other; and Consumer Perception of Colorado and Regional Wine. At lunch, guests will participate in the Colorado Blind Challenge, a blind tasting between Colorado and California wines. Confirmed speakers include Wayne Belding, Master Sommelier; Horst Caspari, Colorado state viticulturalist; Rene Chazotte, Pacific Club; Dave McIntyre, Washington Post; Richard Leahy, East Coast wine consultant; Stephen Menke, Colorado state enologist; Jeff Siegel, freelance wine writer and the Wine Curmudgeon; and Kyle Schlachter, Colorado Wine Press. After lunch, more than two dozen Colorado wineries will pour wines during the Colorado Twitter Taste-Off, where guests will taste and share their thoughts on Twitter, eventually selecting their favorite wines in various categories. The conference costs $35 for the seminars and lunch, and $35 for the Colorado Twitter Taste-Off, or $65 for both. Colorado’s modern wine history dates to the late 1970s, when the forerunner of Colorado Cellars opened. The number of wineries has increased 20-fold since 1990, reflecting the surge in enthusiasm for regional wine in the state. Colorado’s two AVAs include the Grand Valley, in and around Grand Junction, and the West Elks, along the North Fork of the Gunnison. However, the largest concentration of wineries is along the Front Range in and around Denver, expanding to many other parts of the state. DLW 2012 follows the success of the first three conferences -- in Dallas featuring Texas wine in 2009, in Loudoun County featuring Virginia wine in 2010, and in St. Louis featuring Missouri wine in 2011. DLW also holds an annual Regional Wine Week in October, in which more than 40 wine bloggers, writers and columnists from the U.S. and Canada write about their favorite regional wines, ranging from Ontario to New York to Florida to Texas to Colorado. Other conference sponsors include the Colorado Association for Viticulture and Enology, Metropolitan State College, Westword, Colorado Tourism, Amtrak, Visit Grand Junction, and Delta County, Colo. Registration for the conference opens February 1. Go to DrinkLocalWine.com to buy tickets. To reserve a room in the DrinkLocalWine.com hotel block, contact the Sheraton Denver Downtown at (303) 893-3333. For information, call (469) 554-9463 or go to DrinkLocalWine.com.